As more consumers are concerned about healthy living and eating, the fresh fruit and vegetable industry continues to grow substantially. There is higher demand for ready-to-eat fresh-cut fruit and vegetables to fuel our fast-paced society. An increase in consumption of fruits and vegetables has also led consumers to inquire more about where their produce is coming from. They want to know it was processed in a safe and clean facility, ensuring the product safety of the healthy food they are consuming. To meet consumer demands for fresh and safe fruits and vegetables, growers and processors must adhere to high safety standards to prevent product contamination and ensure good quality. Foodborne illnesses have also been of particular concern in recent years as outbreaks of Salmonella, Listeria and E. coli often make the news. Preventing foodborne illnesses from entering the consumer market can protect people’s health and even potentially save lives. Product contamination can tarnish brand reputation if recalls are issued, and it can even result in driving a company out of business. Assuring food safety practices during produce processing is essential to providing safe and healthy ready-to-eat fruits and vegetables from companies that consumers trust. Produce Processing — How Does it Work? Each of these common steps in produce processing involve their own best practices for food safety, but food safety must begin at the growing facility or farm. Best practices should be followed from farm to fork to reduce the majority of common food contamination occurrences. Test soil quality: Soil can contain harmful microbes that can contaminate crops. Soil can be tested before each planting and remediation completed if it contains harmful microbes called pathogens. Test irrigation water quality: Contaminated water is one of the most common sources of microbial contamination of crops. Before selecting a field location, growers should examine upstream uses of irrigation water that could lead to contamination. They should also select an area that’s free from flooding or run-off. Do not irrigate crops before harvest: It’s generally recommended not to irrigate crops for two to seven days before harvest. If water used for irrigation was contaminated, this gap without water provides adequate time for any present harmful pathogens to likely die before the crop is harvested. Use raw manure carefully: It is not uncommon for manure and other biosolids to contain harmful pathogenic microbes if it is not treated before use. Raw manure should be stored in a separate area from crops and with protection to prevent accidental cross-contamination from occurring. If manure is used as a natural fertilizer on a field crop, it’s best practice to wait 120 days before harvesting the produce. Keep animals away from crops: If a farm also has livestock such as cattle or poultry, these animals should not come in contact with crops and should be grazed in a separate contained area where feces cannot run-off into the produce fields. When it’s time for produce harvesting, proper handling of fruits and vegetables must be maintained to prevent contamination. Such measures can include: employees should maintain good hygiene and avoid handling produce if they are feeling ill, harvest bins and tools should be composed of material that should be cleaned before each harvest and is easy to sanitize, once produce is harvested it should be removed from the field quickly and cooled to minimize the amount of continued microbial growth. Refrigerated vehicles used for shipping should be kept clean and cooled before produce is loaded inside. As produce is transported, it should be handled carefully to prevent bruising or damage to the fruits and vegetables which can make them more susceptible to increased microbial growth. Clean and secure loading docks: Loading docks should be kept clean and free of grass, dirt or outside debris. When not in use, loading docks should be closed and locked to ensure outside pests or traffic cannot enter the processing facility. Clean and sanitize all surfaces regularly: Any food contact surface should be cleaned and sanitized regularly to prevent cross-contamination or spreading of microbial contamination. This includes counters where food is prepared and tools such as knives and machines used for processing produce. It’s essential to first clean, which removes any dirt or debris, then follow with a sanitizing step to kill bacteria present. Materials used in any food processing facility should be easy to clean and sanitize. It’s best practice to create a written cleaning and sanitation schedule and ensure it is performed regularly. Enforce good employee hygiene: Gloves should be worn when handling produce, and employees should practice good personal hygiene. Restrooms and employee break rooms should be in a separate area from anywhere produce is processed. Test for harmful bacteria regularly: While it’s important to visually check the cleanliness of food contact surfaces, harmful bacterial pathogens are microscopic and cannot be seen with the naked eye. That’s why regular testing for microbes on food contact surfaces is essential to identify and minimize any areas contamination. Establish preventative plans and hazard controls: Good Manufacturing Practices (GMP’s) and Hazard Analysis and Critical Control Points (HACCP) are essential and effective measures for identifying and controlling risks during produce processing. Creating a written preventative plan is an essential step for food manufacturing safety. Report hazards immediately: Employees should be trained on the importance of food hygiene so they can recognize potential hazards and report them to management at the earliest possible sign. This allows necessary steps to be taken for minimizing the possibility of contaminated product reaching consumers and potentially causing foodborne illness. Catching a potential hazard or risk early may be the only chance for effective remediation prior to release of the product into commerce. Processing of ready-to-eat and fresh produce poses a particular challenge, as it’s typically not pasteurized, cooked or frozen. Those steps typical of other types of food processing help prevent microbial growth in the finished food product. Instead, fresh produce processing usually relies on the post-harvest washing process to remove dangerous bacteria. However, washing can sometimes actually increase the risk of contamination if proper sanitation levels of the wash fluid are not maintained. Chlorine, which is frequently used for sanitation in produce wash water, can interact with organic components in the water and can produce byproducts or biofilm that is left on the produce. These interactions mean that free chlorine levels in produce wash water must be carefully monitored and regulated throughout the entire washing process. Free chlorine concentration of wash water is imperative to minimize activity of common harmful bacteria such as E. coli and Salmonella. When processing fresh produce, it’s particularly important that all food contact surfaces from tools to containers be thoroughly cleaned and sanitized regularly. Blanch produce before freezing: Blanching is the process of quickly and briefly boiling or steaming vegetables or fruit. Blanching is an effective method to inactivate enzymes and damage microbes before freezing which can limit deterioration of the produce. Freeze produce quickly: After blanching produce, it should be frozen rapidly. Reducing the temperature of the product quickly will prevent it from further cooking and help ensure the continued freshness of the product while also slowing the activity of any microbes that might be present. Add ascorbic acid or other preservatives: Another effective technique for stopping enzyme activity in frozen produce is by additional of ascorbic acid, commonly known as vitamin C, to prevent any further chemical deterioration. In 2004, the Food and Drug Administration established HACCP guidelines specifically for fruit and vegetable juices. In addition to general safety and food handling processes, guidelines of the FDA’s Juice HACCP provide possible methods for preventing contamination of fruit juices. The HACCP guidelines require companies to identify the microbe that poses the highest risk for the juice being produced and then apply treatments directly to the juice or fruit and introduce measures that can accomplish a five-log pathogen reduction. Due to their high acidity, citrus fruits may be treated with surface treatments, but all other juices must be pasteurized or otherwise processed to provide appropriate pathogen reduction. Methods for processing fruit and vegetable juices include washing, brushing or sanitizing fruit before juicing or using methods that reduce peel contact during juicing. As with other fresh produce products, juices should be stored at appropriate temperatures for the entire shelf life of the product to provide control of microbial growth. If produce isn’t handled safely, following a complete food safety plan, the brand reputation and consumer health impacts can be severe. According to the Centers for Disease Control, foodborne illnesses has caused 3,000 deaths per year in the U.S. and one in six Americans become ill from eating or drinking contaminated goods each year. While the health impacts are severe enough to inspire better food processing, unsafe food practices are also very financially costly to companies. According to the U.S. Department of Agriculture, foodborne illnesses cost more than $15.6 billion every year. Companies that experience contamination of produce will likely experience large profit losses, as well as a tarnished reputation, especially if they cause consumers to become sick or die. Salmonella: Salmonella is a group of bacteria that is a leading cause of foodborne illness. Produce can become easily become contaminated with Salmonella in the field through contact with animals carrying the pathogen. If a person consumes produce contaminated with Salmonella they are likely to experience fever, vomiting, diarrhea and abdominal cramps. While a healthy person can typically recover from Salmonella infection in four to seven days, children, elderly persons and those with a compromised immune system are at risk of developing complications and more serious illness. Escherichia coli: Escherichia coli, more commonly known as E. coli, is bacteria that lives in the intestines of humans and animals. While most types of E. coli are harmless, some can cause kidney failure, bloody diarrhea, vomiting, severe abdominal pain and even death. Vegetables can easily become contaminated with E. coli if contaminated water is used during farming or the crops come in contact with an animal carrying E. coli. Many people will recover from illness caused by E. coli in six to eight days unless further complications occur. Listeria monocytogenes: Listeria monocytogenes, also known as L. monocytogenes, is resilient bacteria commonly found in water, soil, poultry, cattle and other animals. Listeria can contaminate produce by transfer from soil and water during farming. Unlike many other bacteria, Listeria is capable of growing in colder temperatures, posing a particular risk for food processing facilities as its growth may not be slowed during refrigeration. Common symptoms of Listeria infection are fever, weakness, vomiting and a stiff neck. Listeria is treated with antibiotics and can take anywhere from days to months for full recovery. Listeria is particularly dangerous for pregnant women, infants, elderly people and those with weaker immune systems. Because produce can become contaminated at many various points from growing to a retail shelf, it’s susceptible to a wide range of microbial contamination. While certain types of fruits and vegetables have become contaminated more frequently in the past, any produce can become contaminated if food safety procedures are not diligently followed. Below are some examples of foodborne illness outbreaks caused by contaminated fruits and vegetables in the last two decades. Salmonella: In May 2018, there was an outbreak of Salmonella in pre-cut melons that led to 70 cases with 34 of those resulting in hospitalizations. In 2017, Maradol papayas were contaminated with several different strains of Salmonella. Other recent cases of Salmonella outbreaks in fruit include mangoes in 2012 and cantaloupe in 2012, 2011 and 2008. Listeria monocytogenes: In 2011 a Listeria outbreak caused by contaminated cantaloupes hospitalized 143 people and led to 33 deaths. The outbreak was spread across 28 states with a total of 147 individual cases. In 2014, caramel apples were contaminated with Listeria, causing 35 cases of illness with 34 hospitalizations and seven deaths. Hepatitis A: In 2016, a multi-state outbreak of Hepatitis A occurred due to contaminated frozen strawberries. There were 143 reported cases of illness with 56 hospitalizations, primarily in Maryland, Virginia, West Virginia and North Carolina. Outbreaks caused by human viruses like Hepatitis A are not as common as those caused by pathogenic bacteria but are still be a concern for food producers and processors. Escherichia coli: Leafy greens are the most common vegetable type to be contaminated with E. coli. Romaine lettuce was the source of E. coli outbreaks in 2018, 2011 and 2010. Fresh spinach caused an E. coli outbreak in 2006, spinach and spring mix in 2012 and pre-packaged salads in 2016 and 2013. Salmonella: Cucumbers have recently become the most common vegetable to become contaminated with Salmonella, with outbreaks in 2016, 2014 and 2013. Tomatoes were previously a major source of foodborne Salmonella outbreaks, however recent preventative measures have made Salmonella outbreaks in tomatoes rare, with the most recent outbreak in 2006. Listeria: Listeria outbreaks in the U.S. occurred in 2016 from frozen vegetables and packaged salads. The outbreaks led to four deaths and 28 hospitalizations combined. Cyclospora: Cyclospora is a parasite that typically contaminates produce through animal feces or contaminated water. Cyclospora can lead to intestinal illnesses as well as nausea, bloating, fatigue, diarrhea and loss of appetite. In 2018, Cyclospora outbreaks occurred due to pre-packaged salads sold at a fast food chain as well as contaminated fresh produce trays. If you suspect a potential problem with produce contamination in your growing or processing center, you should perform microbial indicator testing immediately. It’s essential to identify what kind of pathogen you are possibly encountering and how extensive and widespread the contamination potentially is within the processing facility. Locating the source of the contamination can also provide insights into the most effective mitigation strategies. While preventing contamination is best, remediation can be effective if appropriate corrective action steps are taken quickly. After identifying microbial contamination, damaged products should be identified accordingly, and actions should be taken to prevent spread of the harmful microbes to any additional facility areas or other food products. Log10 can provide effective pathogen remediation, consulting strategies and professional food safety services. Our team can locate and identify the specific strain of problematic bacteria and customize an effective treatment to target that specific resident microorganism. Log10’s Pre-Liminate™ brand of custom probiotics can eliminate harmful pathogens from your facility, fruit and vegetable products to help you provide a product that is safe for distribution to consumers. As a produce grower or processor, you know how important it is to release only safe fruits and vegetables into commerce. Whether you process fresh or frozen produce, proper food safety is essential. 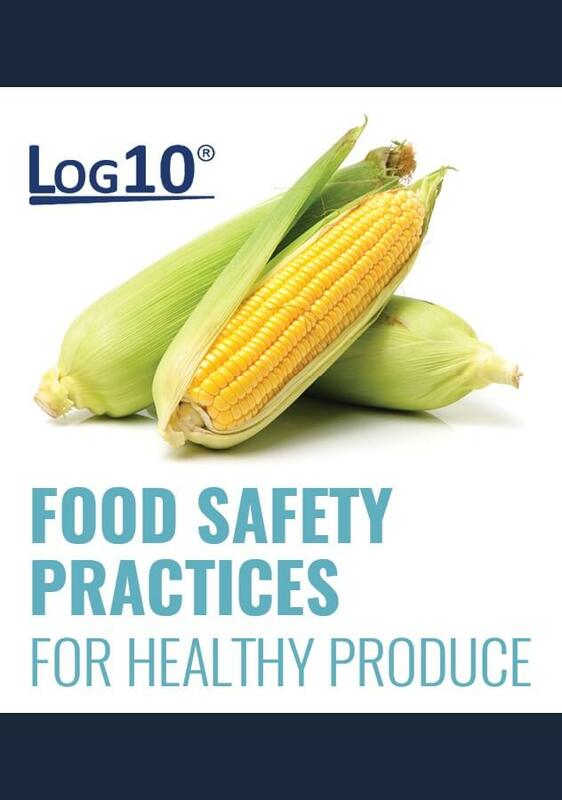 Log10 provides professional consultation and development of a comprehensive food safety plan and a variety of services and products to ultimately have preventive measures in place for prevention of produce product contamination. Our professional team utilizes numerous collective years of food safety expertise to help you develop prevention and control strategies for your specific needs. We also offer training in Good Manufacturing Practices (GMP’s), Hazard Analysis Critical Control Points (HACCP), Sanitation Standard Operating Procedures (SOP’s) and Food Safety Modernization Act (FSMA) preparedness. Log10’s team offers consulting services to equip your company with the best food safety practices, as well as providing effective probiotic treatment to mitigate any potential contamination of your produce products.